This thing looks pretty intriguing. But what is it? 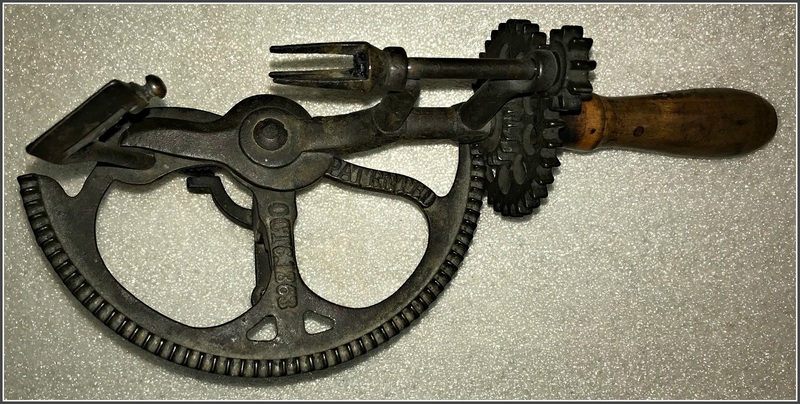 This is just a simple apple parer (also called an apple peeler). They were patented in the 1800s, to meet the growing needs of farmers. Apples were becoming a winter staple for both food and beverages, but had to be processed. Paring, coring and cutting enough apples to meet the winter need was both difficult and time consuming. Farmers first manufactured machines out of wood to make the process go more swiftly. In the 19th century, cast iron led to a boom of patents. Over 100 were issued from 1850 to 1890. It was the Westport Historical Society’s “Westport in 100 Objects” exhibit. The featured item changes every 2 weeks. If you stop in and identify it, you can win something from the gift shop. Just like Reeves Frey did for the apple parer. A new mystery object is now on view at the WHS. This entry was posted in Looking back, Organizations and tagged apple parer, Westport Historical Society. Bookmark the permalink. Yup, def an apple peeler. There was a gentleman with a large collection of antique apple/potato peeler and cutters one fall at Ambler Farms, who would let you try them out. This is the most basic of designs that he had. In the late ‘40’s. No joke!